This photo guide takes you through how to roast butternut squash — and you’ll see how incredibly easy it is! Then you can use it in dozens of recipes! Even before taking pictures of food was part of my job description, I’d find myself in the middle of cooking a recipe looking for my camera. The simple beauty of an ingredient can make me pause. This happens more often than not. Whether I’m peeling asparagus or an onion, slicing beets or citrus, or maybe simply swirling melted butter around a pan, I’m constantly struck at how beautiful food can be. I can’t seem to move forward without first taking a moment to admire it, often times taking a picture while I’m at it. And it can happen over and over with the same foods — for example, every time I slice a roasted butternut squash in half, I love seeing the rich and deep orange color reveal itself, and I slow down, maybe even stop briefly — it’s like a lull in a conversation. This is just one of the reasons to learn how to roast butternut squash. If this sort of thing hasn’t happened to you with food, imagine your driving around a bend in a mountain, and when you make it around the curve, you suddenly see the ocean. It’s stunning, somewhat surprising, and it may make you slow down or even take your breath away. Maybe you’ll even want to take a picture. Get it? I welcome these interruptions when I’m in the kitchen — in fact, it’s part of what I love about cooking. I’ve been working with butternut squash a lot this week and realized how important it is to know how to roast one. If you haven’t done it, it might seem daunting , and having the roasted squash at the ready this time of year is a must. I want to make sure you all know just how easy it is! Step 1: Preheat the oven to 400 degrees F, adjust a rack to the lower third, and place a whole butternut squash on a baking sheet. Pierce it just a few times with a fork. Don’t do anything else! Step 2: Once it’s preheated, place the baking sheet with the squash in it in the oven, and roast until it’s soft to the touch, about 1 hour, 45 minutes. (Cooking times will vary depending on the size of your squash — this timing is for a squash that’s approximately 4-pounds.) After the first 45 minutes, turn it over and you should check on it every 20 minutes or so. When it’s done, the skin will be somewhat wrinkled with some charred areas, and some golden brown spots. Step 3: Let the squash cool so you’re better able to handle it. Then cut the stem end off. Step 4: Now slice it in half lengthwise. Be careful because it it’s still hot, a lot of steam will release at this point. Step 5: Use a large spoon to gently scoop out the seeds and membranes. The color is just so brilliant! Step 6: Keep the seeds — just like those from a pumpkin, they can be roasted and seasoned. Just put them in a fine mesh strainer and rise them, removing any of the squash membranes that might be stuck. Step 7: Gently scoop the soft flesh out of the skin. Aren’t you happy that now you know how to roast butternut squash? And can you believe how easy it is? I love having it on hand. After all, you never know when you’ll want to whip a Chai Spiced Butternut Squash Pie! Good grief, did you see my Facebook comment? I always prepare for a visit to our local ER whenever I pick up my knife – but that was with an uncooked and peeled butternut squash. Thank you – and enjoy a lovely holiday with your family this Thanksgiving. I don’t know why it’s never occurred to me to roast the whole butternut squash first. This is genius. 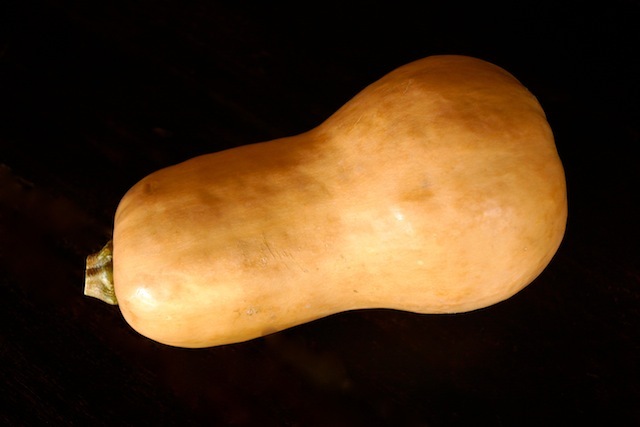 I might eat more squash now. This method for roasting butternut squash is genius! It is so much easier than cubing the hard squash and then roasting. I’m making sauce for lasagna from butternut squash and can’t wait to give this method a try. Will this work with acorn and carnival squash too? I usually halve and then cook in glass pan with water, but now I’m wondering…. So smart. I’ve never roasted it whole, but definitely saves on the impossible squash cutting. Gorgeous pictures! So funny that we roasted squash on the same day. I learned something from you today, though! No need to scoop the seeds in advance! that will save time and sliminess! Happy Thanskgiving!! Hey Val, how about roasting a spaghetti squash? Would that work before adding your sauce? Or would that make the inside too soft for the sauce? Hi Richard! I’ve never roasted a whole spaghetti squash, but I’m sure it would work. Most vegetables like this should be pricked with a fork before roasting (I’ve found the butternut doesn’t need it), so just in case, you might want to prick it a few times before you put it in the oven. I’m thinking it might have a shorter roasting time, so keep an eye on it. Enjoy! I completely agree with the no danger in the kitchen comments. For some reason the minute a knife is in my hands an accident, no matter how careful I am, is only minutes away. I love making butternut squash as well as so many dishes with zucchini. It is the thought of having to use a sharp knife which always scares me away from making it more than I do. I just used this method and it came out fabulous! SO much easier!! Thanks!! Just in time for the season. Now if it will only cool down enough in LA to turn on the oven. Agreed. It’s beautiful, but I’m ready for a sweater!